Norwegian company Brødrene Aa delivered a 42m long carbon fiber 400 pax all-electric catamaran called the Future of the Fjords. The groundbreaking ship is the first of its kind and it follows just a few years after the same company introduced a plug-in hybrid version, called the Vision of the Fjords. The new Future of the Fjords is equipped with a 1.8 MWh battery and two 450 kW electric motors. It will operate at a speed of 16 knots (18.4 mph) for 30 nautical miles (34.5 miles) before the boat must be recharged. Doing two trips every day, it will be tasked with 700 yearly round trips along the spectacular UNESCO World Heritage listed fjord route between Flåm and Gudvangen. While the Future of the Fjords is stunning, the 20-minute fast charging capability makes us drool. To make it happen, Brødrene developed a special PowerDock, 2.4 MWh energy storage system on the water! "This 40m long, 5m wide floating glass fibre dock will sit in the water at Gudvangen, housing a 2.4 MWh battery pack. This charges steadily throughout the day via connection to the local grid network, which does not have the capacity to charge the Future of The Fjords directly. The innovative solution allows the vessel to stably, efficiently and cost effectively ‘refill’ in just 20 minutes. What’s more, the dock also stores consumables, fuel for sister vessels, and allows black water to be offloaded for treatment on land. This makes Future of The Fjords the only passenger vessel not to discharge sewage directly into the fjords." Start of the operation is expected in mid-May. The Fjords takes delivery of groundbreaking "Future of The Fjords"
After a comprehensive test program Future of the Fjords has been delivered from Brødrene Aa to the owner and operator The Fjords. 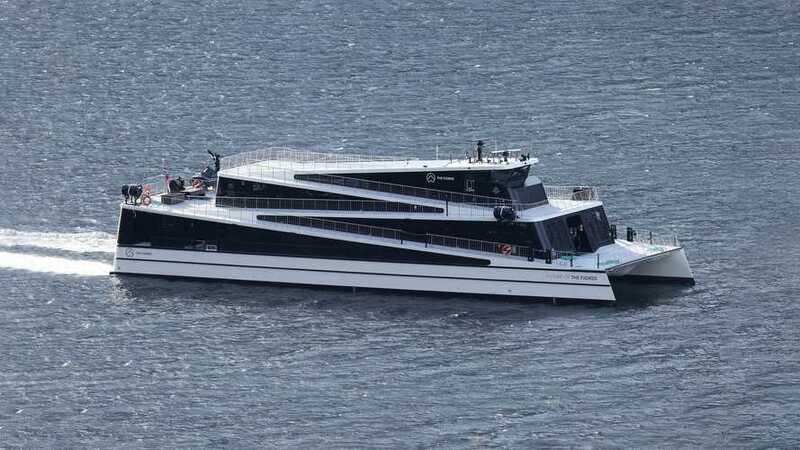 Future of the Fjords, a 42m long carbon fibre 400 pax all-electric catamaran, will begin operation in mid-May, making around 700 yearly round trips along the spectacular UNESCO World Heritage listed fjord route between Flåm and Gudvangen. It is the first vessel of its kind to offer completely emission free transport through the beautiful, yet fragile, Western Norwegian landscape. The newbuild is delivery number two of the Seasight design, succeeding the plug-in hybrid vessel Vision of the Fjords delivered from Hyen in 2016. Although both ships are designed and constructed with the characteristic hulls that mirror the zigzagging mountain paths they sail beside, they are very different once you scratch the surface. Future of the Fjords is the first vessel from Brødrene Aa without a combustion engine propulsion system. 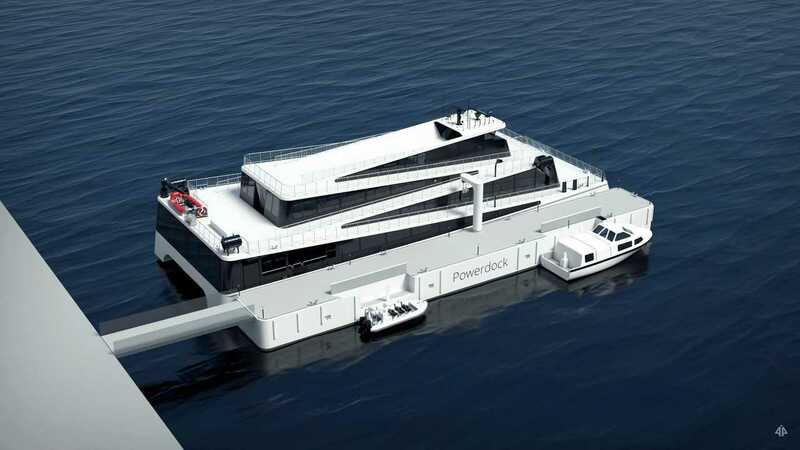 The boat will instead be powered by two electric engines of 585 horsepower each, which will receive power from a battery pack of 1800 kWh. This represents about 40 times the capacity of a typical electric car. The installation makes it possible for the vessel to operate at a speed of 16 knots for 30 nautical miles before the boat must be recharged. "To take the Seasight concept one step further and deliver an emission free vessel with 400 passenger capacity is a milestone in the history of our company, and it confirms that we're entering into a zero-emission future," says Tor Øyvin Aa, CEO at Brødrene Aa. Owner and operator, The Fjords, also believes that the vessel sets new standards for environmentally responsible passenger transport. In another first, Brødrene Aa has, in close cooperation with The Fjords, developed a unique charging solution called the PowerDock. This 40m long, 5m wide floating glass fibre dock will sit in the water at Gudvangen, housing a 2.4 MWh battery pack. This charges steadily throughout the day via connection to the local grid network, which does not have the capacity to charge the Future of The Fjords directly. The innovative solution allows the vessel to stably, efficiently and cost effectively ‘refill’ in just 20 minutes. What’s more, the dock also stores consumables, fuel for sister vessels, and allows black water to be offloaded for treatment on land. This makes Future of The Fjords the only passenger vessel not to discharge sewage directly into the fjords. “We can’t wait to welcome our first passengers on-board for the trip of a lifetime,” Sandvik concludes. Sandvik and Aa both now wish that Future of the Fjords can become a benchmark for environmentally responsible vessel operators worldwide, ushering in a new breed of clean, green and spectacular passenger transport.